Experience the crystal clear waters of the Caribbean and the Virgin Islands sailing aboard this classic sailing yacht. She offers plenty of shade and comfort as well as spacious decks to lay out for sun lovers. This seafaring sloop is uniquely one of a kind. She is a traditional 80 year old wooden sloop that has a legacy of spending over 30 years circumnavigating the globe. During her travels, she endured countless hurricanes and braved numerous pirate attacks. Leave your worries behind. Let our friendly and highly experienced Captain and Crew pamper you on an unforgettable excursion of a lifetime. Captain Ocean will enthrall you with the dramatic history of the Virgin Islands and stories of his around the world voyage on this boat. The crew will serve you a variety of tropical drinks and refreshments from the open bar. Enjoy the boat's superior grilled to order full lunch buffet. The wholesome cuisine includes fresh fish, barbecued meats, vegetables, salads and tropical fruits. The crew also offers vegetarian alternatives upon request. 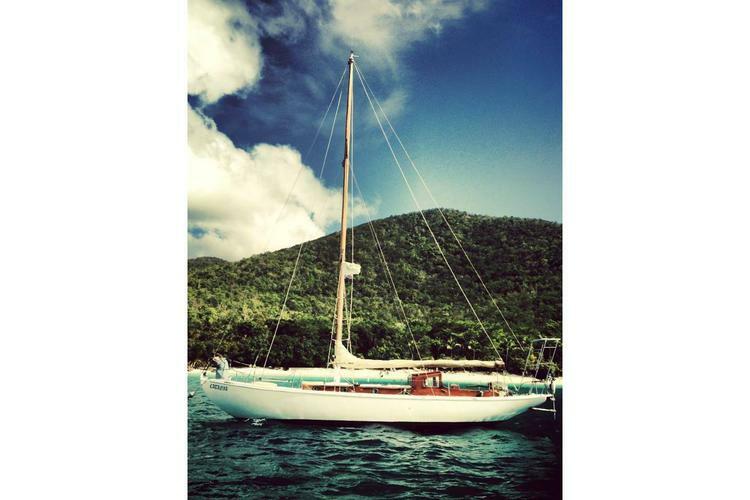 The boat is a world class seafaring wooden sloop. She has circumnavigated the globe for the past 30 years, visiting over 50 countries, 70 islands and 200 ports of call. 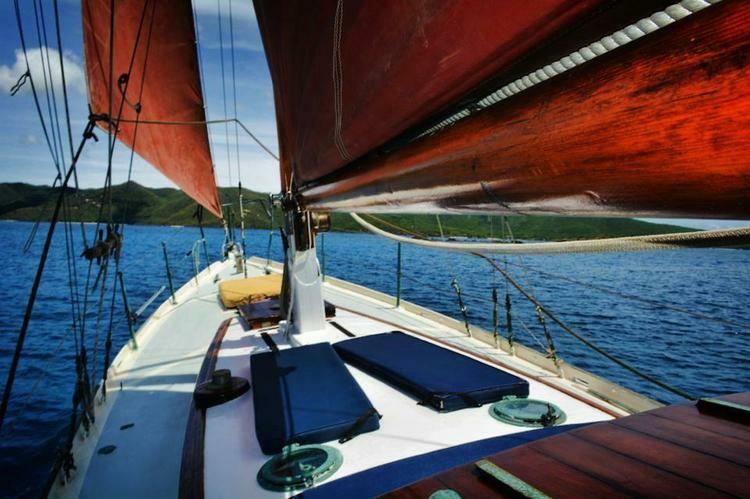 This yacht has well over 50,000 nautical miles under her 4 ton keel. 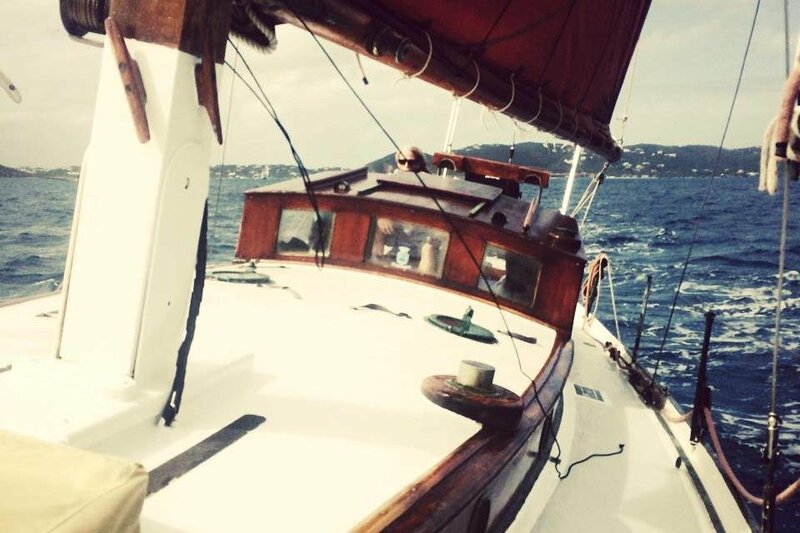 Built in Essex, England in 1938, of select Burmese teak, English oak and bronze, she was designed in the nautical style of the day... long and lean. Exceptional English shipwrights constructed her with awesome attention to detail. Full and half day pricing reflect USVI excursions. 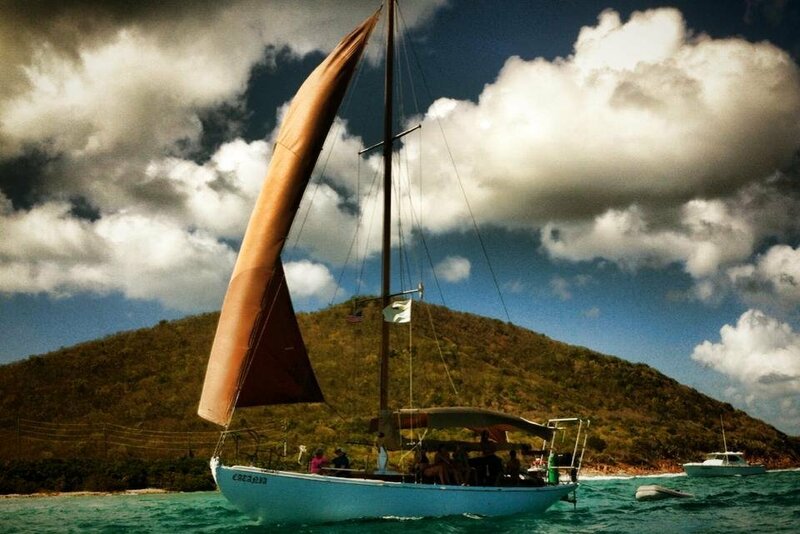 The quarter day pricing reflects a 2 hour sunset sail. 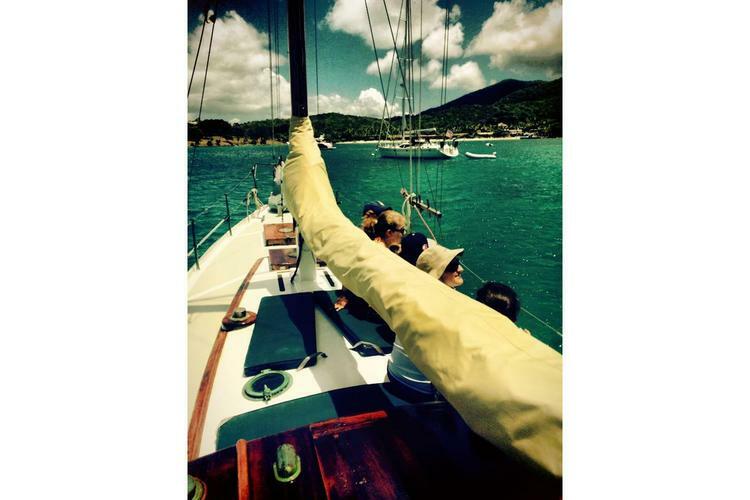 Full day charters to the BVIs are available as well (passport required) for $250/person with a maximum of 6 people. 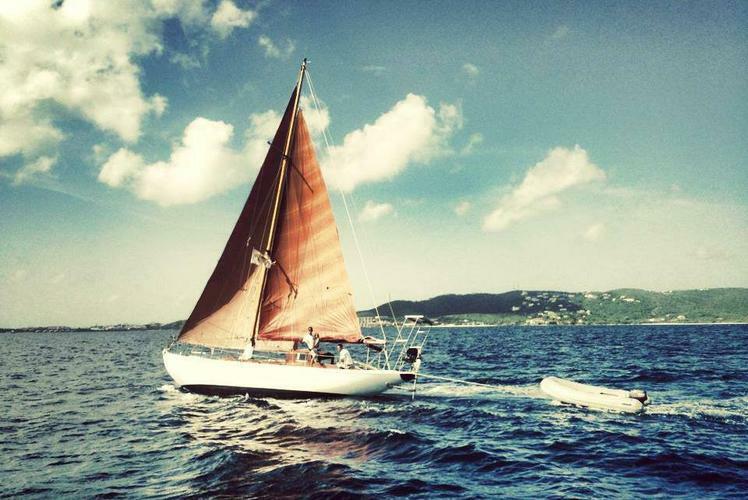 Ocean Moana Taapuna Swienckowski Petersen was born on this classic wooden yacht on the island of Tahiti in the South Pacific. The Petersen family was in the process of circumnavigating the globe. They continued their exploration of the South and North Pacific, until they settled for eight years on a deserted atoll in the Marshall Islands. While there, his parent’s interest in marine biology led them to develop an aquaculture farm cultivating giant clams. During Ocean’s years on the clam farm, he occupied his time by mastering all the water sports available to him. By the age of one, Ocean was swimming, windsurfing with his father, and running barefoot on the coral rubble that was his environment.Three years later, Ocean was carrying his own spear gun and fishing on his own terms. He became fearless in the water. When he was eight, Ocean and his parents continued sailing through Micronesia, the Philippines, Borneo, Malaysia and eventually Thailand. It was here that Ocean was given his first surfboard. He has been hooked ever since. From then on, his only desire was to find the most challenging waves to hone his skills on. In Africa, Ocean surfed many of the countless coves and point breaks from the coast of Tanzania to the shores of South Africa. Many of the surf spots were located in shark infested waters where on average, one surfer would get attacked every month. When the yacht arrived in the Caribbean, Ocean left his home of seventeen years to pursue his own life and career as a captain. At 17 he qualified for his 100 Ton US Coast Guard Captain’s License. Now Ocean captains charter yachts around the US and British Virgin Islands, while always keeping an eye out for the perfect wave. Usually this boat operates around Benner, VI.